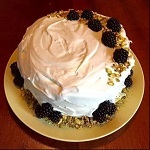 Alley staff members have shared some of thier favorite cake recipes below. Preheat the oven to 350 degrees and prepare either two 9" round pans with butter, flour, and parchment paper or 2 cupcake/muffin pans. With an electric mixer, cream the butter and sugar on medium high until light and fluffy (about 2 minutes). Add the eggs, 1 at a time, mixing well after each addition. In a large mixing bowl whisk together 3 cups of the flour, baking powder, and salt. Set aside. In a measuring cup mix Cranberry Juice, Lemon Juice, and Sprite. With the mixer on low, add the flour mixture and the Lemon juice mixture, alternating between the 2, starting and ending with the flour mixture (3 additions of flour, 2 of lemon juice). Add red food coloring to the desired level of pink. 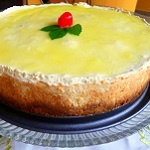 Split the batter between the two 9” round cake or fill each cupcake with ¼ cup batter. Bake until the tops of the cakes spring back when touched or a toothpick inserted into the center comes out with only a few moist crumbs. 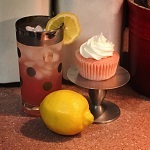 In the bowl of a mixer beat butter and lemon curd until light and fluffy; slowly start adding the confectioners’ sugar in a ¼ cup at a time beating using the lowest speed on the mixer. Occasionally speed the mixer up to get some air into the mix, then stop and scrape down the sides of the bowl and continue adding the sugar. Add in the salt and 1 tbsp. of the heavy cream. Gradually beat in just enough heavy cream to achieve the desired consistency where the frosting is spreadable and soft. If it’s too thick, add in more cream. If it becomes too thin, add in a bit more confectioners’ sugar. If, like me, you like light and fluffy frosting, continue to beat icing on medium-high for 2-3 more minutes. Preheat oven to 350°F. Grease and flour three 8-inch baking pans. Stir together all dry ingredients to a large bowl. Add eggs, buttermilk, oil and vanilla and beat on medium speed about 2 minutes. Stir in Guinness. Pour batter into prepared pans. Beat butter in medium bowl until fluffy. Add powdered sugar and cocoa alternately with whiskey, beating to spreading consistency. Stir in vanilla. Combine all of the these ingredients in a large mixing bowl. Add 6 eggs to the bowl and beat on high for 2 minutes then blend in a ¼ of a cup of whipped cream or milk. Spread this mixture onto the crust. Bake at at 350 degrees for 65-70 minute, or 65-70 at 300 if you have a heavy pan. Chill in pan 2 hours. Invert onto a serving platter and refrigerate. Heat oven to 350 F. Coat two 9-inch round cake pans with nonstick cooking spray. Line bottom of pans with parchment or waxed paper and spray again. In a large bowl, beat cake mix, pudding mix, eggs, vegetable oil and soda on medium-high speed for 4 minutes. Scrape down side of bowl after 2 minutes. Equally divide batter between prepared cake pans. Bake at 350 F for 35 minutes, or until a toothpick inserted in the center comes out clean. Cool cake layers in pans on wire rack for 15 minutes. Turn cake layers out directly onto rack and cool completely. In a large bowl, beat pudding mix and milk for 2 minutes on medium-high speed. Fold in whipped topping. 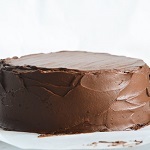 Place 1 cake layer on a serving plate and frost top with 1 cup of the frosting. Place remaining layer on top and frost top and sides. Garnish with chopped nuts. Refrigerate for at least 1 hour before serving. Store in refrigerator. 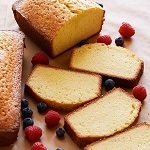 Enjoy a slice of this classic cake on its own or topped with berries and whipped cream. Preheat the oven to 325 degrees. Butter and flour two 9-by-5-by-3-inch (or larger) loaf pans and set aside. Sift the flour with the salt and baking powder two times and set aside. With an electric mixer, cream the butter until fluffy. Add the sugar gradually, beating until light and fluffy. Add the eggs, one at a time, beating well after each addition. Add the flour mixture to the butter mixture, alternating with the milk and vanilla. Stir only until thoroughly blended. Pour batter into the prepared pans, making sure to divide the batter evenly between the two pans. Level tops with an offset spatula. Bake for about 1 1/2 hours, until a cake tester comes out clean. Let the cake cool in the pan about 10 minutes; then remove to a wire rack to cool thoroughly. 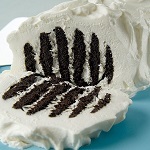 Beat cream with mixer on high speed until stiff peaks form. Gently stir in vanilla. Spread 1-1/2 tsp. whipped cream onto each wafer; stack, then stand on edge on platter. Frost with remaining whipped cream. Refrigerate 4 hours. Cut into diagonal slices to serve. Set a rack in the middle of the oven and preheat to 350 degrees F. Very lightly grease the bottom of two 8 or 9-inch cake pans (do not grease the sides) and then top with parchment rounds. Place the pans on a baking sheet, if possible (this will make taking both cakes in and out of the oven at once a breeze). In a medium bowl, whisk together the flour, cornstarch, baking powder and salt. In a liquid measuring cup, combine the half-and-half and vanilla. Crack the eggs into a small bowl or liquid measuring cup. In a stand mixer fitted with the paddle attachment, combine the butter and sugar on low speed for 3 minutes, then turn up to medium speed and cream for 1-2 minutes, until light and fluffy. Turn the speed back down to low and slowly add the eggs, one at a time, stopping to scrape down the bowl all the way to the bottom after the second and last egg. The batter may begin to look slightly broken by the end of this step; it’s ok.
On medium speed, alternate between adding the dry and wet ingredients, starting and ending with the dry. This shouldn’t take longer than a minute. Scrape down the bowl, all the way to the bottom very thoroughly to make sure there are no hidden dry patches, then turn the speed up to medium and mix for an additional 15 seconds. Spread the batter evenly into the prepared cake pans. Use an offset or regular spatula to even out the tops (don’t skip this step). In the bowl of a stand mixer fitted with the paddle attachment, beat the butter on medium speed until it is smooth, about 1 minute. Add the confectioners’ sugar and cocoa powder to the bowl and beat until combined. With the stand mixer running on low speed, slowly stream in the milk and vanilla extract then add the salt and continue beating until well combined, scraping down the sides as needed, about 2 minutes. Frost the top of one of the cakes with chocolate icing. Place second cake on top of iced cake and ice top and sides of stacked cakes. 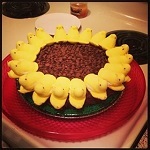 For petals, arrange Peeps around edge of cake, curving slightly and being careful not to separate chicks. For sunflower seeds, arrange chocolate chips in center of cake. Mix all ingredients on low speed until well blended (30 seconds-1 minute). Scrape sides of bowl. Continue beating on medium speed for approximately 2 minutes more. Scrape sides again if needed. Fill 2 different sized metal mixing bowls (able to bake in oven). Bake in a preheated 350 degree oven until golden brown (approx 30-45 minutes). Larger sized bowls may take longer to bake through. Remove from oven and run a knife around inside edges of bowls. Cool before turning bowls over. 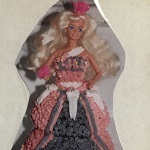 When completely cooled, cut center of cake out to insert any new doll. Invert and place larger cake on bottom. Place smaller cake inverted on top of that. Decorate with frosting, rosettes, ribbons, candies to your hearts content.